My overwhelming memory of homemade hot cross buns is of tough, practically inedible, crosses. So distracting were they, that I have no recollection of the buns themselves. Although I very much doubt that they were of the soft, rich, pillowy variety. More likely, they would have been simple, spiced wholemeal buns with sultanas but no mixed peel (definitely no mixed peel, given my Mum's well documented dislike for it). And so, as I grew up, I found myself drawn to the bakery-bought buns with their doughy crosses, saving myself a small fortune on emergency dentistry. Then one day, a local friend left a small package on my doorstep on his way home from work. Four of his freshly baked stem ginger hot cross buns. 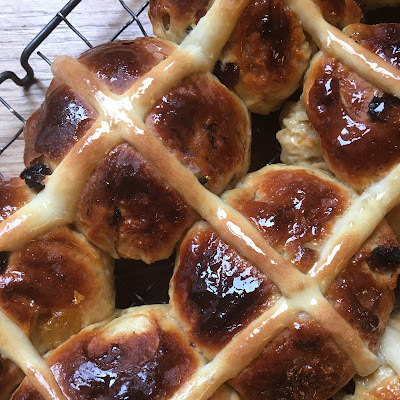 They were everything a homemade hot cross bun should be: rich, sweet, spiced and packed with fruit. Best of all, the crosses had just the right amount of bite. 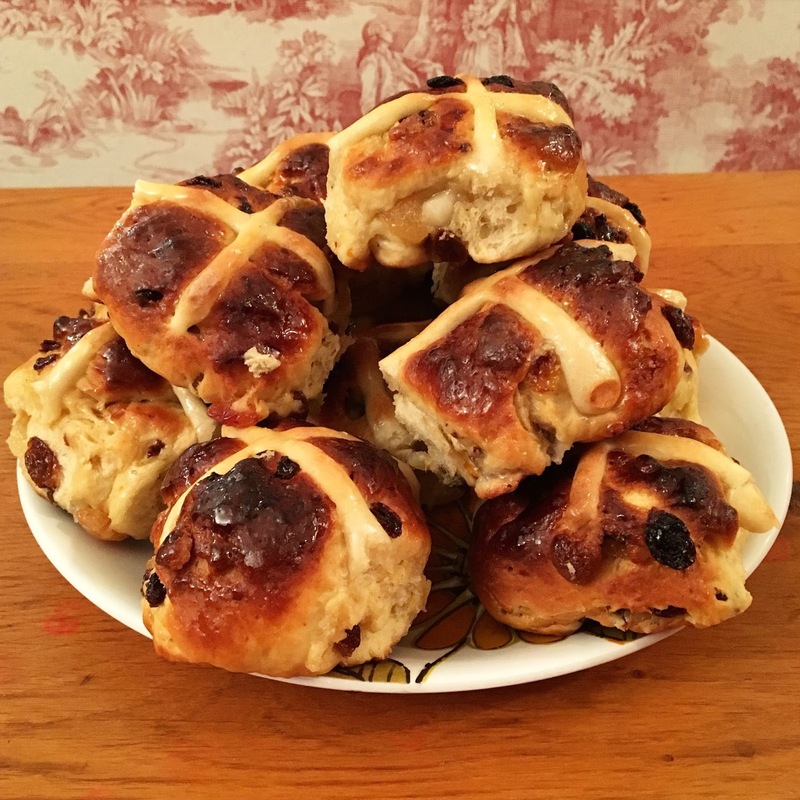 His tip, for this (then) hot cross bun novice, was to use milk instead of water to make the paste for the crosses. Years, and many buns, later I still prefer milk for my crosses. I seem to have inherited my Mum's aversion to mixed peel. Unless it's homemade candied orange and lemon peel of course, but with two small boys constantly around my ankles and the near incessant cries of Mummy, Mummy, Mummy, I was not going to find the time to set about making any in time to put it into this year's hot cross buns (there's always next year). I used a mixture of Turkish black sultanas and golden sultanas. 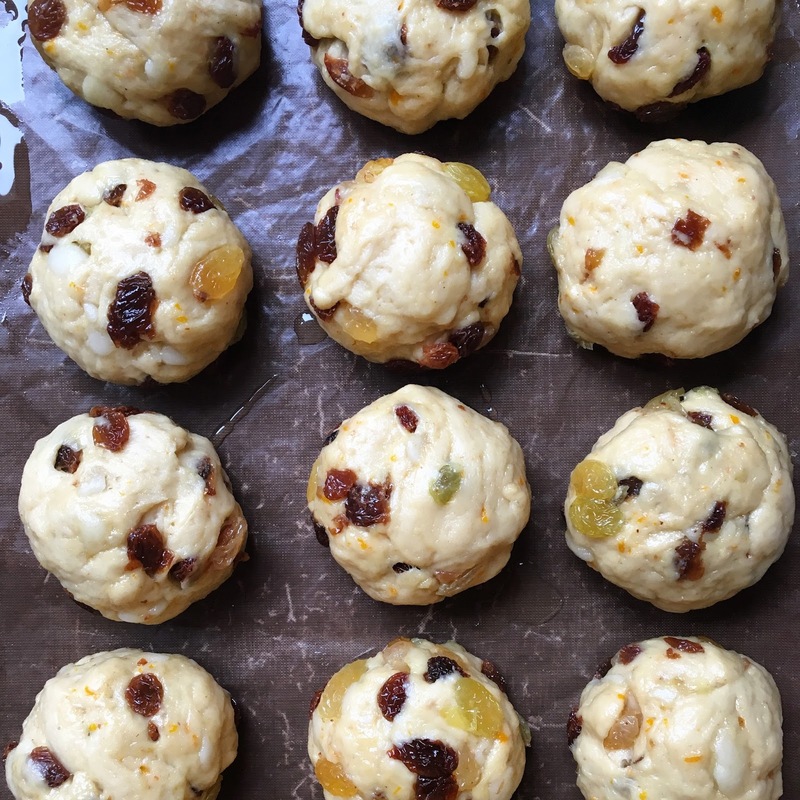 The orange flavour in these buns comes through well without the peel, but you could use ready mixed dried fruit or make up your own mixture of sultanas and good quality mixed peel. I have adapted my recipe this year to adopt Felicity Cloake's method of infusing the milk for the dough with whole spices. It gives the buns a gentle, more subtle, spice. So many shop bought buns have a harshness to them due to over-spicing, which our palates are probably more accustomed to now, so these buns do taste quite different. But do give this method a go, even if just for that gorgeous background flavour of cardamon. Start the day before you want to bake your hot cross buns by preparing the dried fruit. Put the dried fruit, orange zest, cointreau and orange juice into a small pan over a low heat. Heat gently, stirring often, until hot. Remove from the heat, cover and leave overnight (or for at least 4 hours) until the fruit has soaked up all, or most, of the liquid. Put the milk, cinnamon stick, nutmeg, cloves and bruised cardamon into a small pan over a low heat. Bring to the boil, remove from the what and leave to infuse for 1 hour. Mix together the flour, caster sugar, salt, ground ginger and yeast in a large bowl (or the bowl of a stand mixer). Strain the milk through a sieve. Add to the milk, butter and eggs to the flour and mix to form a sticky dough. Tip onto a lightly floured work surface and knead for about 10 minutes (or knead with a dough hook in your stand mixer), until you have a smooth, elastic dough. Put the dough into a lightly greased bowl, cover and leave to prove until it has doubled in size (around 2 hours). Tip the proved dough onto a lightly greased work surface and knock out the air. Scatter the soaked dried fruit and cubed marzipan onto the dough and knead until evenly incorporated. 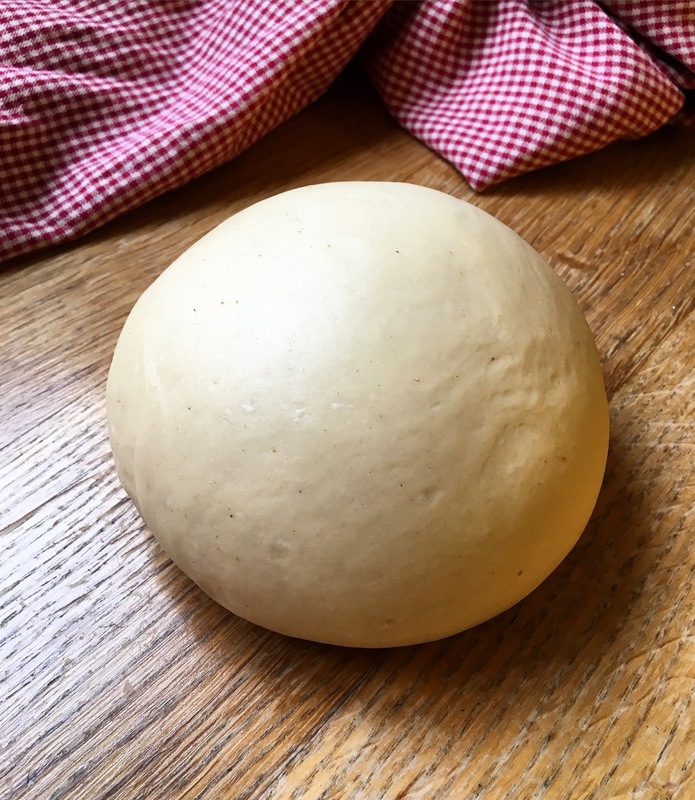 Divide the dough into 15 equal pieces (you can do this by eye, or alternatively by weight which will give you more even buns). Roll each piece of dough into a ball and place in rows on a lightly greased baking sheet. Cover and leave to prove until they have doubled in size. Preheat your oven to 210 C.
To make the crosses, mix the plain flour with enough of the milk to make a thick paste. Transfer the paste to a piping bag fitted with a fine nozzle. Pipe crosses onto the buns, or if you don't have a piping bag, use a teaspoon to draw the crosses. Bake the buns for about 20 minutes until golden brown (depending on your oven, they may need up to 5 minutes more). Whilst the buns are in the oven, make the glaze (if using). Mix the sugar and water in a small pan and heat until the sugar has dissolved but not coloured. Remove the buns from the oven and brush the tops with the glaze. Transfer to a wire rack to cool. 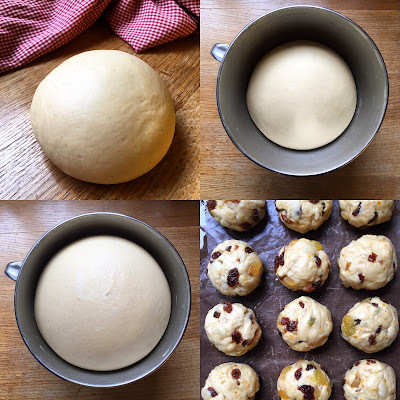 *When I baked these buns again for our Band of Bakers 'Spring Bakes' event last week I queried whether adding the fruit before the first or the second prove made much difference to the buns, resulting in a bit of a debate. I'm not sure it makes that much difference, but I prefer the texture of the buns using the method in my recipe above. The issue is that both the addition of the spice and the fruit slows down the rate at which the dough proves, but in testing this recipe I haven't found that adding the spices to the milk slows down the first prove significantly. Some recipes opt for a 3 stage prove - proving again once the fruit has been added, but before shaping into balls. Which method do you prefer? The sun came out today. It brightened up my day. If I ignore the cheeky bitter wind, my winter coat and bright yellow woolly scarf I can almost (almost) imagine that the warm rays on my face are from the evening Andalusian sun. I close my eyes, feel the heat and I'm back in the little garden of our white washed holiday home high up above the Sacramonte. Dusk is falling, heads pleasantly fuzzy from just one too many glasses of sherry. Giant, sweet red peppers are blistering in the embers of the barbecue, destined for lunchtime salads of salty anchovies, sun ripened tomatoes, crisp white onions, vibrant parsley and generous amounts of local olive oil. Flavours, smells, feelings, colours that map out our year in family meals and holidays. Weeks under the blistering Spanish sun, long Easter weekends with family in France, lazy summer lunches in the little garden of our London home. And so, with the first glimmers of springtime sunshine streaming through the windows, a little warmth creeping in, I crave the vibrant colours of my last holiday under the bright blue Malaga skies. 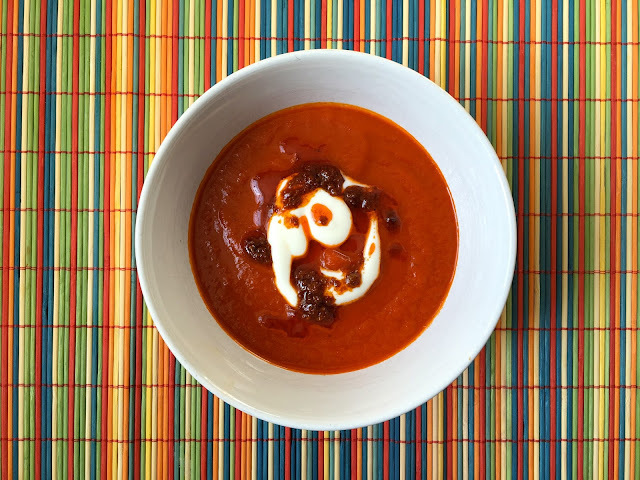 This, the simplest of soups to make, yet visually stunning, bridges the gap between desire and reality. The essence of my summers in a comforting bowl of warm soup. A perfect starter for a relaxed Easter Sunday lunch with family and friends, it can be made ahead of time and is great for babies and children too. Begin by preparing the red peppers. The easiest way to do this is on the gas hob (if you have one) - keep the peppers whole, place them over the flame and keep turning the peppers until their skin is black and blistered. Put the whole peppers into a plastic bag and seal (or place in a bowl and cover with cling film). Leave until cool enough to handle and then remove all of the skin, which should peel away easily, core and seeds. (If you don't have a gas hob you can achieve the same result by putting the peppers - sliced in half lengthways - under a hot grill). Roughly chop the peppers and set aside. Put a heavy based saucepan over a low to medium heat. Add the olive oil and then the chopped red onion. Cook gently, stirring often for 8-10 minutes until the onions are soft, but not coloured. Add the chopped red peppers, plum tomatoes, vegetable bouillon (if using - I don't use stock or salt when cooking for babies under 12 months) and 400ml boiling water to the saucepan. Bring to a gentle simmer and cook for 5 minutes. Remove the soup from the heat, transfer to a blender and blitz until smooth. Put the pureed soup back in the saucepan, season to taste with freshly ground black pepper and salt (if using). To serve, ladle the soup into warm bowls and top each one with a desert spoonful of yogurt and a little harissa oil.